^ Farming. 大英博物馆. [2018-11-21]. （原始内容存档于2016-06-16）. ^ Tannahill, Reay. The fine art of food. Folio Society. 1968. ^ 3.0 3.1 Janick, Jules. 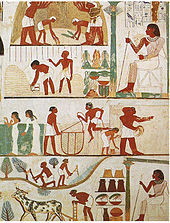 Ancient Egyptian Agriculture and the Origins of Horticulture (PDF). Acta Hort. : 23–39. ^ Kees, Herman. Ancient Egypt: A Cultural Topography. University of Chicago Press. 1961. ^ 5.0 5.1 Gupta, Anil K. Origin of agriculture and domestication of plants and animals linked to early Holocene climate amelioration. Current Science (印度科学院). 2004-07-10, 87 (1): 59. ^ Baber, Zaheer. The Science of Empire: Scientific Knowledge, Civilization, and Colonial Rule in India. 纽约州立大学出版社. 1996: 19. ISBN 0-7914-2919-9. ^ 7.0 7.1 7.2 Harris, David R.; Gosden, C. The Origins and Spread of Agriculture and Pastoralism in Eurasia: Crops, Fields, Flocks And Herds. Routledge. 1996: 385. ISBN 1-85728-538-7. ^ 10.0 10.1 Rodda & Ubertini. The Basis of Civilization--water Science?. 国际水文科学协会. 2004: 279. ISBN 1-901502-57-0. ^ Lal, R. Thematic evolution of ISTRO: transition in scientific issues and research focus from 1955 to 2000. Soil and Tillage Research. 2001, 61 (1–2): 3–12 . doi:10.1016/S0167-1987(01)00184-2. ^ 黄学辉等. A map of rice genome variation reveals the origin of cultivated rice. 自然. 2012-10-03 [2018-11-23]. ^ Needham, Joseph (1986). Science and Civilization in China: Volume 6, Part 2. Taipei: Caves Books Ltd. p55-56. ^ 14.0 14.1 Needham, Volume 6, Part 2, 56. ^ Koester, Helmut (1995), History, Culture, and Religion of the Hellenistic Age, 2nd edition, New York: Walter de Gruyter, ISBN 3-11-014693-2, pp 76-77. ^ 19.0 19.1 19.2 Helmut Koester (1995), History, Culture, and Religion of the Hellenistic Age, 2nd edition, New York: Walter de Gruyter, ISBN 3-11-014693-2, p 77. ^ Johannessen, S.; Hastorf, C.A. (编). 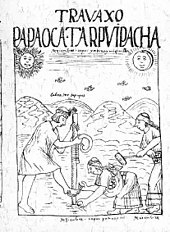 Corn and Culture in the Prehistoric New World. Westview Press. ^ 21.0 21.1 Murphy, Denis. Plants, Biotechnology and Agriculture. CABI. 2011: 153–. ISBN 978-1845939137. ^ Mascarelli, Amanda. Mayans converted wetlands to farmland. Nature. 2010-11-05. doi:10.1038/news.2010.587. ^ Morgan, John. Invisible Artifacts: Uncovering Secrets of Ancient Maya Agriculture with Modern Soil Science. Soil Horizons. 2013-11-06, 53 (6): 3. doi:10.2136/sh2012-53-6-lf. （原始内容存档于2015-03-21）. ^ Spooner, David M.; McLean, Karen; Ramsay, Gavin; Waugh, Robbie; Bryan, Glenn J. A single domestication for potato based on multilocus amplified fragment length polymorphism genotyping. 美国国家科学院院刊. 2005, 102 (41): 14694–99. Bibcode:2005PNAS..10214694S. PMC 1253605. PMID 16203994. doi:10.1073/pnas.0507400102. ^ Office of International Affairs. Lost Crops of the Incas: Little-Known Plants of the Andes with Promise for Worldwide Cultivation. nap.edu. 1989: 92. ISBN 030904264X. ^ Broudy, Eric. The Book of Looms: A History of the Handloom from Ancient Times to the Present. UPNE. 1979: 81. ISBN 978-0-87451-649-4. ^ Rischkowsky, Barbara; Pilling, Dafydd. The State of the World's Animal Genetic Resources for Food and Agriculture. Food & Agriculture Organization. 2007: 10. ISBN 978-92-5-105762-9.